Nadox was once a venerated nerubian leader who taught the ancient ways of his race to generations of broods. When the War of the Spider ravaged Azjol-Nerub, he was overcome by legions of undead. The Lich King reanimated his corpse and bled everything wise and noble from Nadox, forcing him to slaughter his students, friends, and all other nerubians who opposed the might of the Scourge. After Kael'thas's failed assault against the Lich King, some of his greatest blood elf followers were slaughtered and raised into undeath as darkfallen. Prince Taldaram is one of these cunning and bloodthirsty vampiric beings. Always seeking to please the Lich King, he has entered the war-torn depths of Ahn'kahet in search of lost nerubian relics that can empower the Scourge's murderous ranks. For ages, fungi and other benign forms of life have thrived in Ahn'kahet's damp sun-starved caverns. Only recently has Yogg-Saron spread its oppressive will into this isolated ecosystem. The Old God used its immense corruptive powers to warp one of Ahn'kahet's native beasts into a monstrous creature known as Amanitar, an unthinking terror bristling with the destructive energies of its master. Run away from Prince Taldaram's Flame Spheres. Don't not run away from Prince Taldaram's Flame Spheres. Mushrooms appear all around Amanitar. Get away from the poisinous mushrooms and don't kill them. Volazj separates everyone. This is hardest on the healer, so prepare to pop your cooldowns to stay alive! 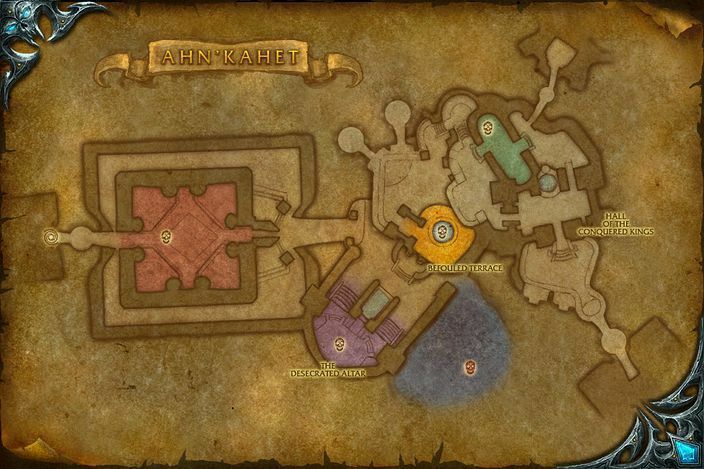 If you haven’t earned these achievements already, completing this dungeon will award Ahn'kahet: The Old Kingdom and Heroic: Ahn'kahet: The Old Kingdom . What's your main goal in Northrend Timewalking dungeons? Transmog? Achievements? Will it be your first time in Ahn'kahet? Let us know in the comments below.